The main finding is that one of every seven insurees (14%) reported having considered switching HPs in the previous five years but did not do so. Another 7% had in fact switched HPs in the previous five years. In total, one out every five insurees had considered switching HPs (and some had done so). About half of those who had considered switching (but did not do so) cited procedural reasons (no desire to deal with the process or with the bureaucracy involved, loss of rights and so forth). Consequently, in our view, access to accurate information on the different means to switch HPs (i.e., through the Internet) and on the laws regulating insuree rights when switching (i.e., the cancellation of waiting periods for supplementary plans and long-term nursing care), the main barriers to mobility within the system would be removed. Another interesting statistic refers to insurees who did change their HP; a fifth did so in order to be treated by a specific physician working with the other HP. Some of these insurees reported switching to follow their family physicians. Of those who had considered switching but did not do so, a tenth reported remaining in their current HP to continue to be treated by a specific physician, especially a family physician. By Israeli law, all citizens or permanent residents must be insured in one of the HPs and may choose which one. In recent years, the procedure of switching HPs has been simplified (e.g., by means of the Internet) and switching does not affect an insuree’s rights. The purpose of the latter measure was to permit greater system mobility and encourage competition. A report by the Ministry of Health (MoH) on moving between HPs in 2017, published in November 2017, stated that a total of 2.2% insurees had done so. To date, most of the switches have been made by regular mail although the Internet is becoming increasingly important in this regard. In the past year, most of the insurees who switched HPs, did so to Clalit although many insurees left it as well. The highest net number of insuree switches (incoming minus outgoing transfers) was to Maccabi. The report also showed that in 2016, localities with a low socio-economic status (cluster 1) and a geographically peripheral status (cluster 2) had a relatively high rate of switching compared with the national average (4.4% and 6.7% respectively). How many insurees switched health plans – and why? All the interviewees were asked: “In the past five years, how many times have you switched HPs?” Insurees who said that they had switched, were asked for their main reason for leaving their previous HP. 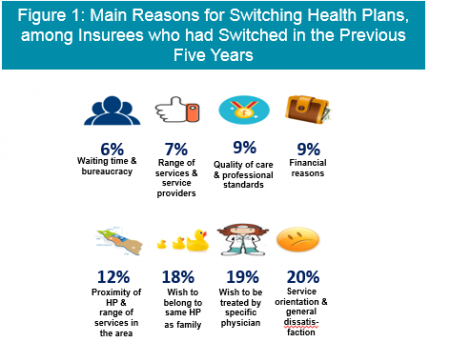 7% of all insurees said they had switched HPs in the five years preceding the survey. The rate of transfers showed regional differences, with the highest in Jerusalem (11%) followed by Haifa and the north (7%), Tel Aviv and the center (6%) and lastly, the south (5%). Other reasons cited for switching HPs were: the proximity of an HP to home (12%), financial considerations (9%), quality of care and the professionalism of service providers (9%), the range of services offered (7%), bureaucracy (2%), and waiting times (4%). Interestingly, the main reasons for switching HPs related more to the possibilities of choice and patient-focused care than to such topics as quality of care and costs. Regarding the rate of system mobility among specific population groups in Israel, we learned that Arabs switched more than non-Arabs (10% vs. 6%, respectively), and immigrants from the Former Soviet Union (FSU) less so than others (4% vs. 7%, respectively). The 65+ age group, the chronically ill, and women also switched less than others: among the 65+ age group, 2% switched vs. 8% among the 22-64 age group; 4% of the chronically ill switched vs. 8% of the rest of the population; only 4% of women reported having switched vs. 9% of men in the five years preceding the survey. How many insurees had considered switching health plans? Another question directed at the interviewees was: “In the past five years, did you consider changing to another HP but did not do so?” All those who had considered switching were asked for the main reason that they had ultimately not done so. 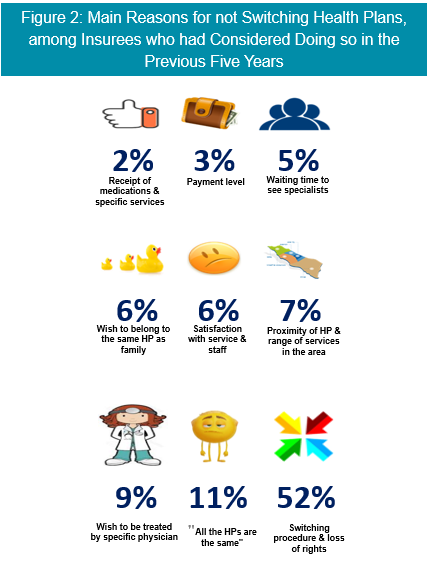 In total, 14% said they had considered switching HPs in the previous five years but had decided not to do so. Here too, there were differences between the HPs: at Clalit, 14% reported having considered the move, at Maccabi – 8%, at Leumit – 28%, and at Meuhedet – 18%. The main reason cited for having decided not to switch was fear of the process (52%). This reason broke down into lack of knowledge or desire to go through the process (43%), fear of rights being affected (5%), and various bureaucratic problems (4%). Fear of switching, lack of knowledge about the procedure, and related insuree rights can be solved by making information accessible to the public. Other main reasons for not switching were: the claim that “All the HPs are the same” (11%), and an insuree’s wish to be treated by a specific physician who works in the current HP (9%). While no differences were found in general satisfaction with an HP, note that a difference was found between insurees who had considered changing but had not, and insurees who had not considered changing. Of the former, 39% said they were not very satisfied or satisfied with their HP vs. 6% of the others. The examination of the rate of insurees considering switching HPs among different populations in Israel showed that Arabs, FSU immigrants and adults aged 65+ had considered the move less than others. Among Arabs, it was 8% vs. 16% for the rest of the population; among FSU immigrants, it was 11% vs. 15% for the rest of the population; and for adults aged 65+, it was 7% vs. 15% of the 22-64 age group. MJB has been following the functioning of the health system from the perspective of insurees since 1995. The most recent survey was conducted in August-December 2016 under Dr. Shuli Brammli-Greenberg, Tamar Medina-Artom, and Alexey Belinsky. It was supported by a steering committee representing the HPs, MoH, Ministry of Finance, NII, and consumer organizations. Data collection was performed at MJB accompanied by the research team, under the Data Collection Unit headed by Chen Tzuk-Tamir and assembled by Lev Zhivaev. The sample was representative of Israel’s adult population (aged 22+). In 2016, mobile-phone owners were included in the sample. Interviews were conducted of 2,513 people in three languages (Hebrew, Arabic and Russian), with a response rate of 68%. The sample characteristics resembled the population characteristics according to data of the Central Bureau of Statistics, MoH, and NII. Age was weighted to arrive at a precise representation of the different age groups. The differences presented in the document are all statistically significant unless stated otherwise.